Today’s post rambles on about the large number of apps that I have installed on my iOS devices (there are valid reasons…read on). Also — some exciting iOS music community news will be be posted here soon, so check back by this weekend. There are in total about one hundred apps installed across my three iOS devices that are used in music creation. So the question comes to mind, how many apps does one need to use in order to create music on an iOS device? A better question: How many apps does one need in order to fully explore the music making capabilities of iOS devices? I’ve more than doubled the number of music apps in my collection over the last year, I also increased the number of iOS devices during that span too. This activity has helped me to expand and to branch out and create new and different kinds of music. As I explore new apps, and listen to what the iOS music community creates with them, I learn much about various genres of music for which I had little prior knowledge. Mostly it’s been the genres IDM, EDM, Dubstep, etc. All within the sphere of Electronic Music, or Techno. For me, it’s exciting and new. Not all of my newer apps are dedicated to electronic music. No, that’s just been a side benefit. Most of my recent app purchases cover traditional instruments such as: brass, sax, piano, organ, orchestra, and harpsichord. I am gradually building a collection of apps that will allow me to create music in just about any music style. A large variety of instruments, and from all over the world are needed; its a big world and a slow process. The high quality instrument and DAW apps run towards the higher end of the app price spectrum, while many audio effects, sequencer, and beat-making apps tend toward the lower side of the pricing structure. And there are free apps, some free upon introduction, some are free with IAP (In App Purchase) for upgrades and increased functionality, and other apps are 99 cents. I have a lot of the free, and low priced apps. With such little risk it makes sense to check out most everything, even apps that normally would have no appeal. The possibility of real discovery exists within things that oft times reside just beyond our comfort zone. By exploring outside of my typical musical sphere I’ve let some of these apps guide me to new vistas and that has helped to expand my music horizons. ; in both listening and in creating. Each app has a learning curve, with some it’s quick and easy; others are deep and complex. Many iOS music apps emulate functions that music producers have used on desktop computers for a long time, or actual hardware units, while other apps have a totally new take on how to generate or manipulate sounds. The complexity within some apps can be within a familiar area, such as audio recording, or something totally new (such as slicing a running loop into 32 distinct, interconnected, and warped parts…a la Sector). The unique touch interface of these modern devices has lead to many innovative music creation apps. Even with the more traditional style of music apps, the touch interface brings an intimacy that is just not found anywhere else. For a long while, professional (and home) music production has been dominated by desktop software and therefore the keyboard/mouse has been the main interface (besides actual musical instruments and vocals, of course). As it turns out, most people don’t like the PC mouse very much and find a touch interface easier to use for almost everything PC related. The Apple iDevices and apps are actually changing what we define as a musical instrument. Some apps, such as Orphion (with a unique sound between that of a string and a drum), are new musical instruments in their own right. To play Orphion’s interesting sound requires a new and unique playing method. Another app, Gestrument (which uses recorded samples for its sounds), has a totally new concept for how the sounds are triggered on a touch screen. Figure and Thumbjam apps, as examples, both react uniquely to when, where, and how hard the user interacts with the screen. Both apps have a striped area for note entry but where they may seem similar in appearance; sound generation, play methodology, note entry and control are vastly different. As I’ve mentioned in other posts, an aspect of the iOS touch interface that is a bit underexposed are the ergonomics. Often I find it easier to play notes on the touch screen rather than a traditional keyboard. My hand pain comes from arthritis…many others have a variety of physical problems for which touch screens can be a solution. Interesting though that some apps are designed to work best with an external pressure sensitive MIDI keyboard. These are typically keyboard emulation apps, such as Korg: Module. This app has very high quality piano, organ, and electric piano sounds and as such needs the familiar musical keyboard interface for correct expressive play. In the professional recording studio (and for the serious home based produce), beyond instruments and microphones there is the high-dollar software, usually expensive hardware interfaces, such as mixers (to route instrument and microphones signals) and DAC (digital/analog converter) units. The expense of a new PC is probably less than the total for the needed music production software. My iPad (in comparison of function only; not of quality or capacity…got a long way to go on that yet) can be a complete recording studio just by itself. With the addition of a CCK (camera connection kit), a MIDI keyboard is easily plugged in and then used to control various instrument and effects apps. Other adapters allow for connection of microphones, synthesizers, and electric guitars directly into iOS devices. I have a desktop iPad interface that accommodates all of that, plus MIDI and output to studio monitors. These extras are great to have and can help improve the quality of sounds, but having studio monitors is essential for mixing and mastering. The true beauty of mobile music making on iOS devices is that with a good mixture of apps (and ideas and talent and skill and desire…) one can compose, and record a complete work in any music genre with no hardware interface in sight. 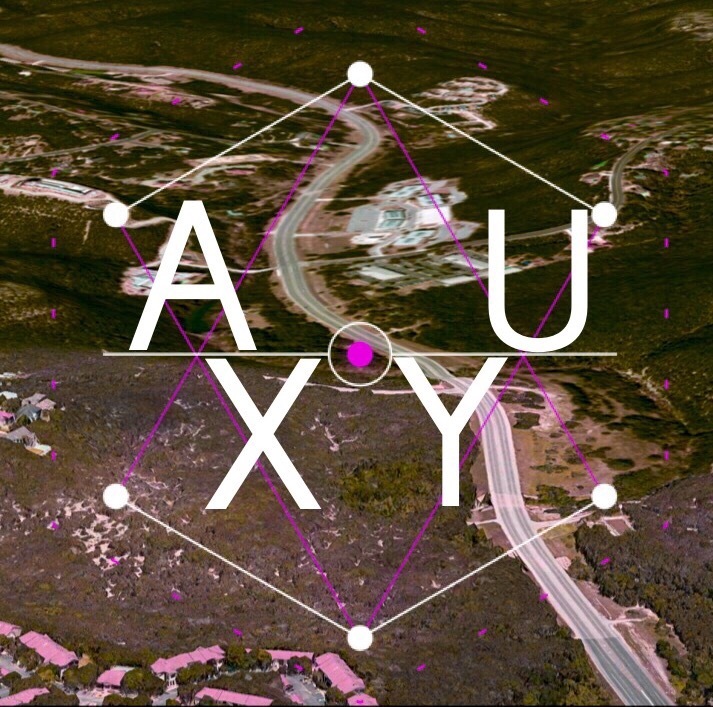 From a complex orchestral arrangement, to a jazzy ballad, to a glitched out, mangled and shredded piece of dark industrial techno; all one needs is the proper set of apps. Having additional hardware certainly enhances the capabilities but is not necessary. Okay so the above count is 97, but that can fluctuate as apps get deleted from one device or all, and then a new app or two appears. One hundred music apps is a fair number to state for how many music making apps are currently installed across my iOS devices. Is that too many apps? How many are actually used? Are all of these apps needed? Yes, it is too many; they are not all used, and no all of them are not needed. With the low pricing structure of the App Store it is quite easy to load up on apps. But especially with many acquired free or at very low cost, these app numbers have ballooned. I have been consuming iOS apps for almost four years, however the majority of apps in my collection were acquired within the last year which reflects both the increased number of available apps and my dedication to and better understanding of music production on iOS. When the cost of a quality effects app (like Aufx: Space, a reverb app), is the same or less than a cup at Starbucks, then it is very easy to justify the app purchase. This kind of thinking can easily steer one over to the path of massive app consumption. One can treat it like a disease, like a game, or maybe just accept that app exploration is a necessary part of the iOS musical journey. The last that I checked, there were over 500 Audiobus compatible apps on the App Store. That is a significant number of apps and helps to explain why a large portion of the iOS music community is centered around Audiobus (both the app and the website/forum). If not for this pivotal app, the iOS music making landscape would be vastly different and possibly quite barren. There are some incredible music making apps and there are some that are beautiful in form, but lack function. Other apps are very simple in design and function but deliver excellent results. There are broken apps and some have even been abandoned. Some apps have had millions of downloads (Apple’s Garage Band, Korg’s Gadget, and Loopy HD — all top notch apps). While other well written, fully functional apps linger with just a few hundred downloads. 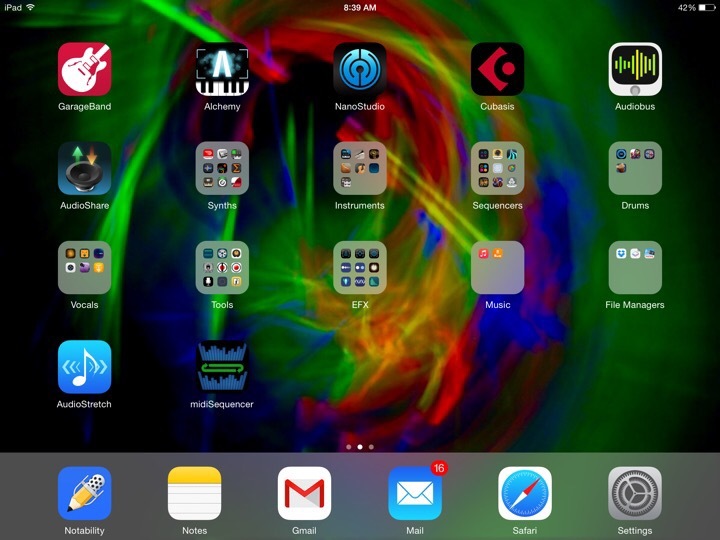 As to the original question: how many apps are needed for music making using an iOS device? I suggest that the answer is within the range of 1 and 500. 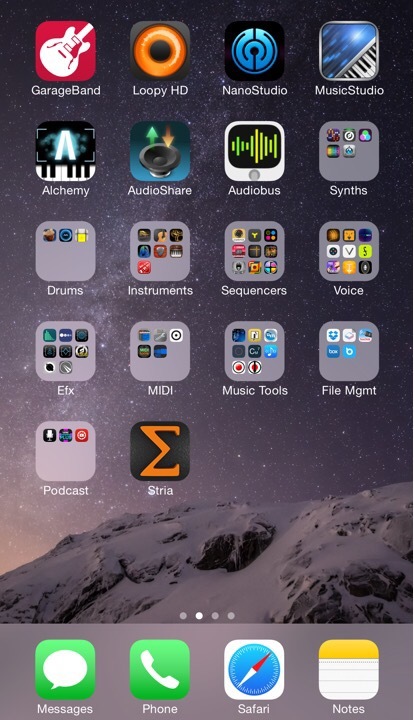 And how many apps are needed to be able to fully explore the universe of iOS music making? The same range: 1-500! For me, one hundred seems to work okay, but that will change soon enough, I have app pruning and rearranging tasks ahead of me.